When a tiny fish shoots into view wearing a round blue top hat (which happens to fit him perfectly), trouble could be following close behind. So its a good thing that enormous fish wont wake up. And even if he does, its not as though hell ever know what happened, will he. Visual humour swims to the fore as the bestselling Jon Klassen follows his break-out debut with another deadpan-funny tale. 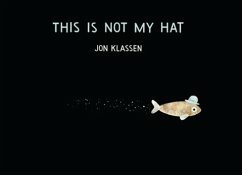 Jon Klassen kommt ursprünglich aus Ontario, Kanada. Heute lebt er in Los Angeles und arbeitet als Illustrator, Designer und Konzept künstler. Unter anderem gestaltete er ein Video für die Band U2.